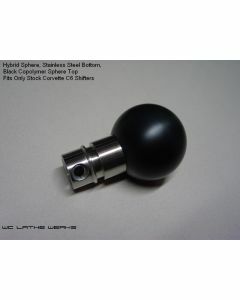 These shift knobs fit any C6 Corvette with the stock shifter (or aftermarket shifter that fits the stock knob). The knobs attach using a sideways screw and the boot ring connects to the knob by sliding it upward and turning. No special tools are necessary. 2005-07: Knobs include a boot lip to slide the leather boot over. 2008-2013: Knobs include a boot groove for the silver boot ring to clip on to.